With his small, gauntly appearance and his twisted mouth, Fung Fung is one of these memorable faces that filled kung fu comedy. 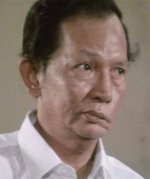 He was no bit player though, but rather a famed character actor, a prolific writer-director of Cantonese cinema as well as the progenitor of film talent with four of his eleven children making names for themselves within the industry. Born in 1916, Fung Fung started acting at seventeen in Cantonese Opera. Eventually at some point during the thirties he began doing movies. Quite handsome in his young days, Fung played leading man parts. He started writing movie scripts in 1949 and directing the following year. One of the first movies he directed, The Kid, had him co-star with a young child actor of some repute, named Siu-lung, "Little Dragon", better known later on in the western world as Bruce Lee. Later that year Fung Fung suffered a terrible accident with a fitness machine, which distorted his face and damaged his eye nerves. Fung’s days as a leading man were over and he began his career as a character-actor playing freaks, but he continued on as a filmmaker, directing and writing more than fifty movies over the next twenty years during the golden age of Cantonese cinema. He also continued sprouting offspring, four of which as mentioned earlier became involved in the film industry - eldest daughter Fung Siu-bo becoming a famed actress and star, Fung Hark-on a movie stuntman, action director, and perpetual villain, Fung Kit-lung a screen writer and Petrina Fung Bo Bo a beloved child actress and star of Cantonese cinema. Both daughters were part of the so-called Seven Cantonese Princesses (that also included Josephine Siao, Connie Po Chu and Nancy Sit). With the collapse of Cantonese cinema at the very dawn of the seventies, Fung Fung’s career as a film writer/director was effectively over, and he turned to working in TV. As Cantonese Cinema made a comeback in the second half of the seventies, Fung took small parts and guest starring short cameos in kung fu and comedy vehicles; a good deal of the films in which he was appearing had his son Fung Hark-on working in an acting, fight choreographer or director capacity and was done seemingly as a favor to him. Iron Fisted Monk (77), Enter The Dragon (78), Follow The Star (78), Young Master (80), and Legend Of A Fighter (82). Fung also made an appearance in Eighteen Jade Arhats (78), Tsui Hark’s We're Going To Eat You (80), Michael Hui’s Security Unlimited. (81). Fung Fung passed away in February 2000.